Despite having almost every other aspect of their lives and careers scrutinised by writers, the role of fashion in The Beatles' legend has until now been largely under reported. The group was, however, just as influential with their dress sense as with their music, remaining at the forefront of popular fashion throughout much of the 1960s. 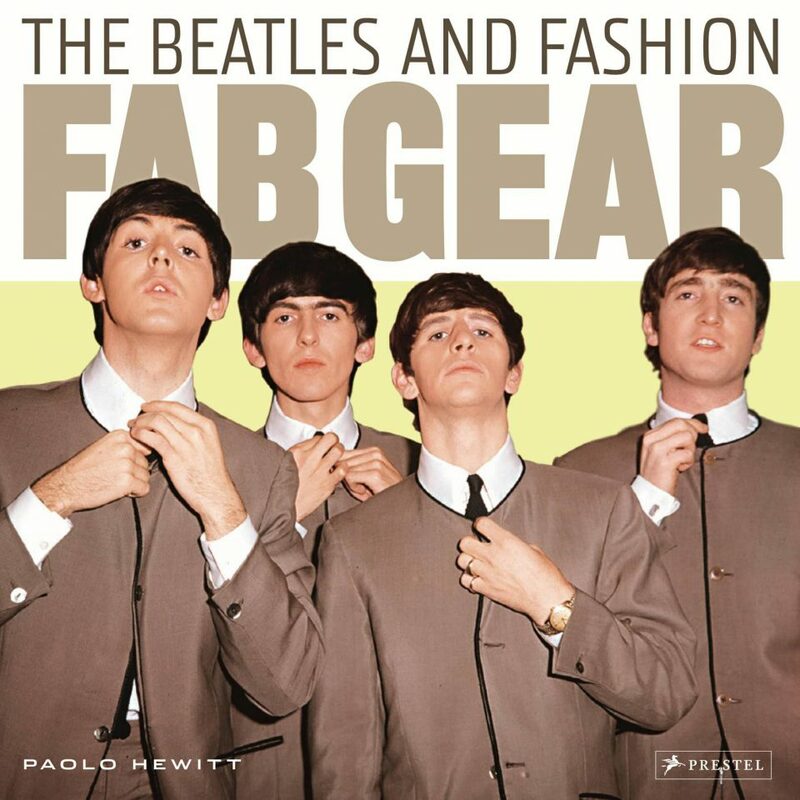 Fab Gear: The Beatles And Fashion takes the reader through The Beatles' early leather-clad days in Hamburg and Liverpool, through the suited and booted years into the psychedelic realm of Sgt Pepper and Apple, and onwards to their more understated post-India later years. Moving from mods to dandies, pills to LSD and Carnaby Street to Chelsea, they had strict ideas about their image, adopting and adapting contemporary styles, taking the best aspects before moving on to the next. Paolo Hewitt, a music journalist and author who has previously written books on acts including The Small Faces, Paul Weller and Oasis, is well placed to document The Beatles' changing styles. No sartorial slouch himself, he exudes a clear passion for clothes, for the sharp bespoke Mod fashions and aesthetic elegance which were once commonplace but now largely a thing of the past. How many music writers also have their own brand of knitwear? Many of the key people who worked with The Beatles are interviewed, including their first tailor Walter Smith, their late-60s hairdresser Leslie Cavendish, and staff from the Apple Boutique and Apple Tailoring. The book is divided into five chapters, beginning with the early Teddy Boy-influenced pre-fame days, moving forward with Brian Epstein's suited and booted visions of unity, and to the dandified mid-60s psychedelia and beyond, where sharp tailoring gave way to Edwardian hippy garb sold in exclusive London boutiques. A chapter on the group's hair explores the origins of the moptop and details The Beatles' ever-lengthening hairstyles. It is followed by a final section on The Beatles' experiments in retail: the ill-fated Apple Boutique and Apple Tailoring, and Cavendish's little-known Apple Hair salon. Just as many Liverpool youths first heard American rock 'n' roll from sailors arriving from New York, the so-called 'Cunard Yanks' also arrived with imported shirts, ties, suits and jeans. The sailors were, for a time, the best-dressed people in town, although the teenage Teddy Boys, bikers and beatniks were all vying to be noticed too. John Lennon, The Beatles' early leader, was in turn a Teddy Boy and art school beatnik, seemingly unsure which way to jump. Ringo Starr was less indecisive, becoming a full-on Ted in order to conform in the rough working class neighbourhood of Liverpool's Dingle area. George Harrison, we learn, was the most image conscious of the group. At school he would endlessly make adjustments to his uniform, wearing brightly coloured waistcoats, pink shirts and drainpipe trousers. Turned away from a succession of Liverpool cobblers unable to make him a pair of corduroy shoes, he eventually got his wish once The Beatles were global superstars for whom no desire was too outlandish. Paul McCartney, meanwhile, used subtle conformity in order to follow the crowd but not stand out. He never grew his hair too long, had his trousers taken in only so much, and wore smart jackets and blazers to look presentable and not offend his parents. But it was McCartney who brought perhaps the biggest influence on the group's style. During a trip to Butlin's holiday camp as a teenager, he saw a group of five men dressed alike, and the effect was profound. I was standing there in my school cap and everything, on a roasting hot day near the swimming pool, when out of the Calypso Ballroom came five guys from Gateshead. And they all looked alike. They each had on a tartan flat cap with a grey crewneck sweater, tartan shorts, pumps, and they carried white towels under their arms. They walked in a line across to the pool to have a good old swim and I noticed everyone's heads turn and go, WHO'S THAT? In that second a penny dropped for me and I realised the power of looking something. They won the talent contest at Butlin's for whatever they did – and you just knew that they would win. The Beatles used clothes to present themselves as a group, a gang, a band of brothers that Mick Jagger called the Four-Headed Monster. They worked with designers and tailors during each phase of their career, creating new looks to complement their endlessly innovative music. In the US, The Beatles' style paved the way for an influx of British designers and mod fashion. Despite their love of the early rock 'n' roll look, Lennon in particular was disparaging about US fashions, saying the American youths were five years behind the British. Within the group, each man used clothes to express his own individuality. We hear of how Lennon wore hats during the US invasion as a way to become noticed by the press pack, to set him apart as leader of the group; how Harrison, the most reluctant Beatle, was the only member not to wear their signature black boots during the group's final concert; and how McCartney's hair was skilfully arranged by Leslie Cavendish to give an illusion of length during the late 1960s. It was with clothes and hair that Lennon started to signify he was moving on from The Beatles. By growing his hair and becoming unshaven, and by adopting Yoko Ono's stark black or white dress code, he publicly stated that his allegiance had switched away from his bandmates. Hewitt dispells a few myths along the way. The collarless jackets, for example, ubiquitous in 1962 and 1963, were inspired by a garment made in Hamburg by Astrid Kirchherr for Stuart Sutcliffe, and not, as Lennon claimed, by one he bought during a 1961 trip with McCartney to Paris. The section on Apple is perhaps the highlight of the book. Hewitt explains that the boutique's failure was not, as is widely held, the result of light-fingered staff and customers, but of high prices for elaborate designs, lack of retail experience, and a reluctance by The Beatles to invest in new products. John Lyndon, brought in to run the boutique when Lennon's former schoolfriend Pete Shotton proved unable to turn a profit, is particularly revealing, explaining how the idea to close the store and give its contents away was, in fact, Yoko Ono's, voiced during a July 1968 meeting. I was in the room the day they decided to give it away. John Peel wrote an article in the Melody Maker, and this article talked about "Jewish rag merchants," and that was always a sore point to John. Yoko said to John, "John, you are not a Jewish rag merchant", and then she said, "Give it away." Well, it is very easy for someone to say "Give away £300,000" – which today would be about £2 million – when it isn't their money to give away. But she was the one that said, "Give it away, you are not a Jewish rag merchant." This was in a meeting with the four boys, Yoko and myself, and no one has ever written that. Ringo couldn't care less, George kept going in and out, it was Paul trying to hold it all together, and the minute John thought that giving it away was a splendid idea, Paul was defeated. That is what happened. John did not say, "Give it away." Paul did not say, "Give it away." It was Yoko, and every book has got that wrong. Hewitt also reveals that the famous mural on the outside wall of the Apple Boutique was whitewashed not upon orders of the council, but by the building's owners Portman Estates. There are plenty of little-seen photographs taken inside the Apple stores – unfortunately many in black-and-white rather than colour, but which nonetheless give a flavour of those heady patchouli-scented days. Fab Gear contains more than 300 photographs from the Getty archives, many of which were unpublished since the 1960s but a number of which are over-familiar. It would have been preferable, instead, to see dressmaker patterns for some of the clothes, or to get close ups of the garments held in private collections or museums, some of which are sold as replicas. Style, it becomes clear, is all about attention to detail. It's a shame, then, that the book contains several unfortunate mistakes. Jürgen Vollmer is twice wrongly credited with having first heard The Beatles at Hamburg's Kaiserkeller, whereas every Beatlemaniac surely knows it was Klaus Voormann who discovered them. And some of the picture captions – possibly not written by Hewitt – are carelessly written. A shot of The Beatles with Wilfrid Brambell in A Hard Day's Night is described as being from Help!, while a picture of Katy Perry dressed as Freddie Mercury is inexplicably captioned "The impact of the band's Sgt Pepper look continues to echo down the ages". Minor misgivings aside, the bulk of Fab Gear is an exercise in thoroughness and passionate investigation. Paolo Hewitt has opened a treasure trove of historic details and period photographs to students of fashion and Beatles fans alike, providing an authoritative and compelling account as richly varied as The Beatles' own transformation throughout the 1960s. A cool book, great photos. another really GREAT read is the 9 book series about John Lennon’s life, written like novels but with completely factual books, 2 are out right now: “Shoulda Been There” & “Shivering Inside” both writen by Jude Southerland Kessler- a huge gotta read!!! They are so awesome, makes you feel you are right there!!!! Excellent photos in this book!!! I don’t believe that’s an error, at least not as you describe it. Saying that Vollmer “first heard The Beatles at Hamburg’s Kaiserkeller” isn’t the same as saying that Jurgen Vollmer “heard the Beatles first,” as in before certain others. Vollmer “first heard The Beatles at Hamburg’s Kaiserkeller” means that the first time Vollmer heard the Beatles was at the Kaiserkiller, which is true.It doesn’t address him seeing them there before or after anyone else did. Also, it seems that Mark Lewisohn’s Tune In supports the idea that John and Paul did buy collarless jackets in Paris when, in fact, visiting Jurgen Vollmet there. Tune in also tells of Astrid Kirchherr making one for Stuart Sutcliffe, as well as for herself. Also, that others in the “Exi” crowd wore such jackets. So, if Lennon claimed he was inspired “by one he bought during a 1961 trip with McCartney to Paris.” then it seems fair to allow Lennon to tell us which of those incidents most inspired them to get similar jackets made for the band..
Did you read that chapter in Tune in? What do you think?